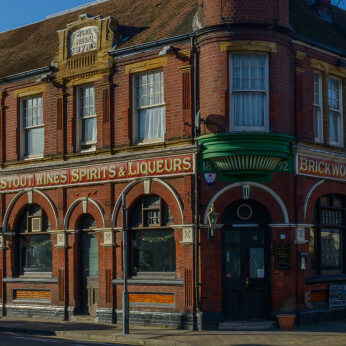 Constructed in 1892 for Brickwoods Brewery to a design by A H Bone, the Nell Gwynne features a distinctive 'witches hat' tower - one of a small number of similar constructions built across the city in the late Victorian period (of which around five still survive). Darts and pool is played and Sky/BT Sports is used to show major events including football and Six Nations rugby union on 3 large screens. Live music is hosted regularly and meat raffles are held at weekends. Gaming machines are available and the jukebox contains every top 40 single since 1952! Which is FREE Mondays and Thurdays. The single bar is bare-boarded, with a series of upholstered bench seats running around the perimeter of the room. Traditional tables and chairs can also be found, as well as a sofa at the end of the bar counter. A focal point is the real fire, providing plenty of warmth during the colder months. We're really sorry but we don’t seem to have any offers or events for Nell Gwynne. We're sure there must be something happening here but they just haven't told us about it! Please do mention this to Nell Gwynne when you next visit them.